C programming. Some in-depth knowledge of C programming is needed, like pointer usage, bit manipulating functions, etc. Microprocessor programming. It is necessary to know how microcomputers work internally: memory addressing, interrupts, etc. All of these concepts should be familiar to an assembler programmer. There are several different devices in Linux. For simplicity, this brief tutorial will only cover type char devices loaded as modules. Kernel 2.6.x will be used (in particular, kernel 2.6.8 under Debian Sarge, which is now Debian Stable). When you write device drivers, it’s important to make the distinction between “user space” and “kernel space”. Kernel space. Linux (which is a kernel) manages the machine's hardware in a simple and efficient manner, offering the user a simple and uniform programming interface. In the same way, the kernel, and in particular its device drivers, form a bridge or interface between the end-user/programmer and the hardware. Any subroutines or functions forming part of the kernel (modules and device drivers, for example) are considered to be part of kernel space. User space. End-user programs, like the UNIX shell or other GUI based applications (kpresenter for example), are part of the user space. Obviously, these applications need to interact with the system's hardware . However, they don’t do so directly, but through the kernel supported functions. All of this is shown in figure 1. The kernel offers several subroutines or functions in user space, which allow the end-user application programmer to interact with the hardware. Usually, in UNIX or Linux systems, this dialogue is performed through functions or subroutines in order to read and write files. The reason for this is that in Unix devices are seen, from the point of view of the user, as files. On the other hand, in kernel space Linux also offers several functions or subroutines to perform the low level interactions directly with the hardware, and allow the transfer of information from kernel to user space. Usually, for each function in user space (allowing the use of devices or files), there exists an equivalent in kernel space (allowing the transfer of information from the kernel to the user and vice-versa). This is shown in Table 1, which is, at this point, empty. It will be filled when the different device drivers concepts are introduced. Table 1. Device driver events and their associated interfacing functions in kernel space and user space. There are also functions in kernel space which control the device or exchange information between the kernel and the hardware. Table 2 illustrates these concepts. This table will also be filled as the concepts are introduced. Table 2. 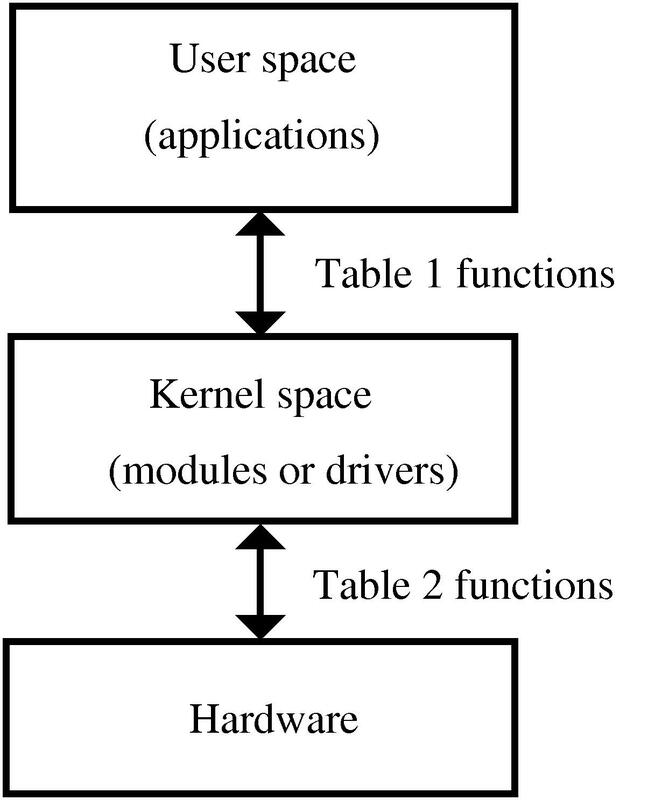 Device driver events and their associated functions between kernel space and the hardware device. I’ll now show you how to develop your first Linux device driver, which will be introduced in the kernel as a module. Since the release of kernel version 2.6.x, compiling modules has become slightly more complicated. First, you need to have a complete, compiled kernel source-code-tree. If you have a Debian Sarge system, you can follow the steps in Appendix B (towards the end of this article). In the following, I’ll assume that a kernel version 2.6.8 is being used. This extremely simple module belongs to kernel space and will form part of it once it’s loaded. The insmod command allows the installation of the module in the kernel. However, this particular module isn’t of much use. By issuing the lsmod command again, you can verify that the module is no longer in the kernel. The summary of all this is shown in Table 3. Table 3. Device driver events and their associated interfacing functions between kernel space and user space. When a module device driver is loaded into the kernel, some preliminary tasks are usually performed like resetting the device, reserving RAM, reserving interrupts, and reserving input/output ports, etc. These tasks are performed, in kernel space, by two functions which need to be present (and explicitly declared): module_init and module_exit; they correspond to the user space commands insmod and rmmod , which are used when installing or removing a module. To sum up, the user commands insmod and rmmod use the kernel space functions module_init and module_exit. The actual functions hello_init and hello_exit can be given any name desired. However, in order for them to be identified as the corresponding loading and removing functions, they have to be passed as parameters to the functions module_init and module_exit. The printk function has also been introduced. It is very similar to the well known printf apart from the fact that it only works inside the kernel. The <1> symbol shows the high priority of the message (low number). In this way, besides getting the message in the kernel system log files, you should also receive this message in the system console. This module can be compiled using the same command as before, after adding its name into the Makefile. In the rest of the article, I have left the Makefiles as an exercise for the reader. A complete Makefile that will compile all of the modules of this tutorial is shown in Appendix A. When the module is loaded or removed, the messages that were written in the printk statement will be displayed in the system console. If these messages do not appear in the console, you can view them by issuing the dmesg command or by looking at the system log file with cat /var/log/syslog. Table 4 shows these two new functions. Table 4. Device driver events and their associated interfacing functions between kernel space and user space. I’ll now show how to build a complete device driver: memory.c. This device will allow a character to be read from or written into it. This device, while normally not very useful, provides a very illustrative example since it is a complete driver; it's also easy to implement, since it doesn’t interface to a real hardware device (besides the computer itself). After the #include files, the functions that will be defined later are declared. The common functions which are typically used to manipulate files are declared in the definition of the file_operations structure. These will also be explained in detail later. Next, the initialization and exit functions—used when loading and removing the module—are declared to the kernel. Finally, the global variables of the driver are declared: one of them is the major number of the driver, the other is a pointer to a region in memory, memory_buffer, which will be used as storage for the driver data. In UNIX and Linux, devices are accessed from user space in exactly the same way as files are accessed. These device files are normally subdirectories of the /dev directory. To link normal files with a kernel module two numbers are used: major number and minor number. The major number is the one the kernel uses to link a file with its driver. The minor number is for internal use of the device and for simplicity it won’t be covered in this article. Also, note the use of the kmalloc function. This function is used for memory allocation of the buffer in the device driver which resides in kernel space. Its use is very similar to the well known malloc function. Finally, if registering the major number or allocating the memory fails, the module acts accordingly. In order to remove the module inside the memory_exit function, the function unregsiter_chrdev needs to be present. This will free the major number for the kernel. The buffer memory is also freed in this function, in order to leave a clean kernel when removing the device driver. The kernel space function, which corresponds to opening a file in user space (fopen), is the member open: of the file_operations structure in the call to register_chrdev. In this case, it is the memory_open function. It takes as arguments: an inode structure, which sends information to the kernel regarding the major number and minor number; and a file structure with information relative to the different operations that can be performed on a file. Neither of these functions will be covered in depth within this article. When a file is opened, it’s normally necessary to initialize driver variables or reset the device. In this simple example, though, these operations are not performed. This new function is now shown in Table 5. Table 5. Device driver events and their associated interfacing functions between kernel space and user space. The corresponding function for closing a file in user space (fclose) is the release: member of the file_operations structure in the call to register_chrdev. In this particular case, it is the function memory_release, which has as arguments an inode structure and a file structure, just like before. When a file is closed, it’s usually necessary to free the used memory and any variables related to the opening of the device. But, once again, due to the simplicity of this example, none of these operations are performed. This new function is shown in Table 6. Table 6. Device driver events and their associated interfacing functions between kernel space and user space. To read a device with the user function fread or similar, the member read: of the file_operations structure is used in the call to register_chrdev. This time, it is the function memory_read. Its arguments are: a type file structure; a buffer (buf), from which the user space function (fread) will read; a counter with the number of bytes to transfer (count), which has the same value as the usual counter in the user space function (fread); and finally, the position of where to start reading the file (f_pos). The reading position in the file (f_pos) is also changed. If the position is at the beginning of the file, it is increased by one and the number of bytes that have been properly read is given as a return value, 1. If not at the beginning of the file, an end of file (0) is returned since the file only stores one byte. In Table 7 this new function has been added. Table 7. Device driver events and their associated interfacing functions between kernel space and user space. To write to a device with the user function fwrite or similar, the member write: of the file_operations structure is used in the call to register_chrdev. It is the function memory_write, in this particular example, which has the following as arguments: a type file structure; buf, a buffer in which the user space function (fwrite) will write; count, a counter with the number of bytes to transfer, which has the same values as the usual counter in the user space function (fwrite); and finally, f_pos, the position of where to start writing in the file. In this case, the function copy_from_user transfers the data from user space to kernel space. In Table 8 this new function is shown. Device driver events and their associated interfacing functions between kernel space and user space. The stored character will not change until it is overwritten or the module is removed. I’ll now proceed by modifying the driver that I just created to develop one that does a real task on a real device. I’ll use the simple and ubiquitous computer parallel port and the driver will be called parlelport. The parallel port is effectively a device that allows the input and output of digital information. More specifically it has a female D-25 connector with twenty-five pins. Internally, from the point of view of the CPU, it uses three bytes of memory. In a PC, the base address (the one from the first byte of the device) is usually 0x378. In this basic example, I’ll use just the first byte, which consists entirely of digital outputs. 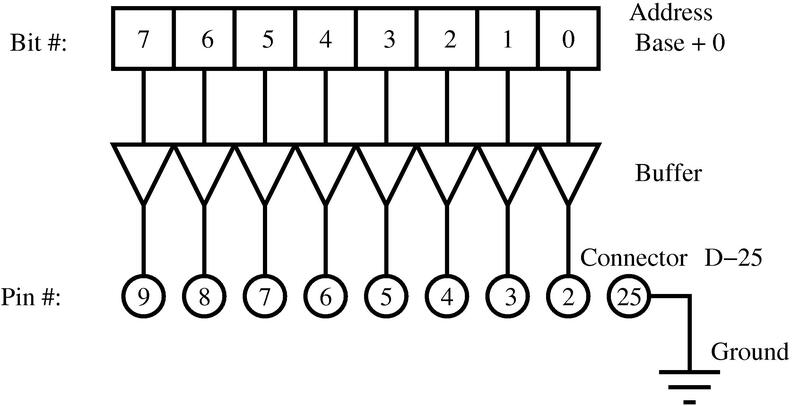 The connection of the above-mentioned byte with the external connector pins is shown in figure 2. The previous memory_init function needs modification—changing the RAM memory allocation for the reservation of the memory address of the parallel port (0x378). To achieve this, use the function for checking the availability of a memory region (check_region), and the function to reserve the memory region for this device (request_region). Both have as arguments the base address of the memory region and its length. The request_region function also accepts a string which defines the module. It will be very similar to the memory module but substituting the freeing of memory with the removal of the reserved memory of the parallel port. This is done by the release_region function, which has the same arguments as check_region. In this case, a real device reading action needs to be added to allow the transfer of this information to user space. The inb function achieves this; its arguments are the address of the parallel port and it returns the content of the port. Table 9 (the equivalent of Table 2) shows this new function. Device driver events and their associated functions between kernel space and the hardware device. Again, you have to add the “writing to the device” function to be able to transfer later this data to user space. The function outb accomplishes this; it takes as arguments the content to write in the port and its address. Table 10 summarizes this new function. In the initial section of the driver a different major number is used (61). Also, the global variable memory_buffer is changed to port and two more #include lines are added: ioport.h and io.h. In this module-initializing-routine I’ll introduce the memory reserve of the parallel port as was described before. This routine will include the modifications previously mentioned. This routine is identical to the memory driver. Again, the match is perfect. The reading function is similar to the memory one with the corresponding modifications to read from the port of a device. It is analogous to the memory one except for writing to a device. In this section I’ll detail the construction of a piece of hardware that can be used to visualize the state of the parallel port with some simple LEDs. WARNING: Connecting devices to the parallel port can harm your computer. Make sure that you are properly earthed and your computer is turned off when connecting the device. Any problems that arise due to undertaking these experiments is your sole responsibility. The circuit to build is shown in figure 3 You can also read “PC & Electronics: Connecting Your PC to the Outside World” by Zoller as reference. This should turn on LED zero and six, leaving all of the others off. Finally, I’ll develop a pretty application which will make the LEDs flash in succession. To achieve this, a program in user space needs to be written with which only one bit at a time will be written to the /dev/parlelport device. The lights will flash successively one after the other! 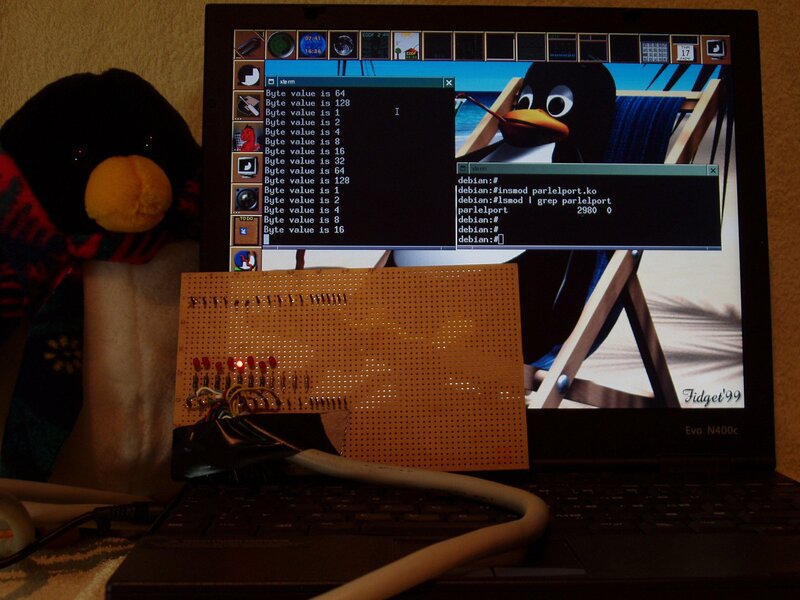 The flashing LEDs and the Linux computer running this program are shown in figure 4. Having followed this brief tutorial you should now be capable of writing your own complete device driver for simple hardware like a relay board (see Appendix C), or a minimal device driver for complex hardware. Learning to understand some of these simple concepts behind the Linux kernel allows you, in a quick and easy way, to get up to speed with respect to writing device drivers. And, this will bring you another step closer to becoming a true Linux kernel developer. A. Rubini, J. Corbert. 2001. Linux device drivers (second edition). Ed. O’Reilly. This book is available for free on the internet. Jonathan Corbet. 2003/2004. Porting device drivers to the 2.6 kernel. This is a very valuable resource for porting drivers to the new 2.6 Linux kernel and also for learning about Linux device drivers. B. Zoller. 1998. PC & Electronics: Connecting Your PC to the Outside World (Productivity Series). Nowadays it is probably easier to surf the web for hardware projects like this one. M. Waite, S. Prata. 1990. C Programming. Any other good book on C programming would suffice. Reboot the machine to make this the running kernel image. This is done semi-automatically by Debian. You may need to tweak the lilo configuration file /etc/lilo.conf and then run lilo to achieve this. Copy the default Debian kernel configuration file to your local kernel source directory cp /boot/config-2.6.x .config. Make the kernel and the modules with make and then make modules. I once wrote two device drivers for two ISA Meilhaus boards, an analog to digital converter (ME26) and a relay control board (ME53). The software is available from the ADQ project. Get the newer PCI versions of these Meilhaus boards and update the software. Take any device that doesn’t work on Linux, but has a very similar chipset to another device which does have a proven device driver for Linux. Try to modify the working device driver to make it work for the new device. If you achieve this, submit your code to the kernel and become a kernel developer yourself! Three years have elapsed since the first version of this document was written. It was originally written in Spanish and intended for version 2.2 of the kernel, but kernel 2.4 was already making its first steps at that time. The reason for this choice is that good documentation for writing device drivers, the Linux device drivers book (see bibliography), lagged the release of the kernel in some months. This new version is also coming out soon after the release of the new 2.6 kernel, but up to date documentation is now readily available in Linux Weekly News making it possible to have this document synchronized with the newest kernel. Fortunately enough, PCs still come with a built-in parallel port, despite the actual trend of changing everything inside a PC to render it obsolete in no time. Let us hope that PCs still continue to have built-in parallel ports for some time in the future, or that at least, parallel port PCI cards are still being sold. This tutorial has been originally typed using a text editor (i.e. emacs) in noweb format. This text is then processed with the noweb tool to create a LaTeX file ( .tex ) and the source code files ( .c ). All this can be done using the supplied makefile.document with the command make -f makefile.document. I would like to thank the “Instituto Politécnico de Bragança”, the “Núcleo Estudantil de Linux del Instituto Politécnico de Bragança (NUX)”, the “Asociación de Software Libre de León (SLeón)” and the “Núcleo de Estudantes de Engenharia Informática da Universidade de Évora” for making this update possible. Fremantle counselling -- does it interest you? If software development is stressing you out, or if you need help, you can have Perth Counselling at your fingertips!